Mastodon, seen here in their natural Ice Age environment. Mastodon was a Progressive Sludge Metal band that roamed North America and most of Eurasia during the last Ice Age from the early to late Pleistocene epoch (roughly 3,000,000 to 10,000 BCE). Though early Mastodon subsisted almost entirely on abrasive guitar riffs, latter-day Mastodon evolved into a more Progressive sound, and ultimately became one of the apex bands of the American New Wave Metal scene in the Pleistocene epoch. For those without comedic tastes, the so-called experts at Wikipedia have an article about Mastodon. The fossil record indicates that Mastodon not only inhabited, but thrived in both Metal and Progressive climates, making them one of the most genre-versatile bands of the era. Evidence suggests that the band most likely originated in North America’s harsh Sludge Metal pockets—areas where the only forms of musical sustenance were abrasive guitar riffs and amp feedback. Mastodon's suspected range, with the known sites of live shows indicated by red dots. In the middle of the Pleistocene epoch, Mastodon migrated south to take advantage of the budding Metal and Hard Rock scenes on the now-warming North American continent. In their new environment, the band would come to face stiff competition from rivals like Disturbed and System of a Down, two bands that ultimately proved to be more successful despite lacking Mastodon's technicality and versatility. 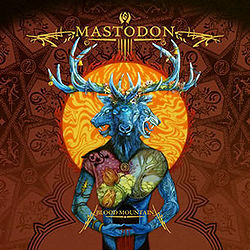 During this same period, Mastodon made forays into Progressive lands as well. Most paleontologists believe that Mastodon was extremely successful living in Progressive climates, and adapted to them even better than the Sludge Metal areas the band originated in. However, a small group of paleontologists from progarchives.com state the opposite, and claim that Mastodon never totally adapted to the Progressive landscape. Scientists in the later school of thought point to Mastodon’s continued reliance on 4/4 time signatures and traditional instrumentation to support their position. The consensus, however, remains that Mastodon did adapt to Progressive environments, and was more than able to hold its own against potential rivals like Isis, Opeth, Tool, Porcupine Tree, and The Mars Volta. Brent Hinds uses his Gibson Flying-V to fend off a potential challenger. 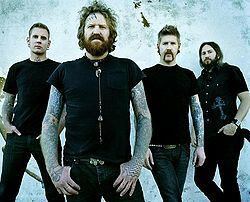 Throughout their career, Mastodon maintained one of the most defined and rigid social structures of any known band during the Pleistocene, with each member knowing both their place in the pecking order and their responsibilities. 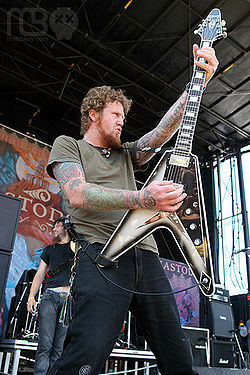 Brent Hinds was the band’s lead guitarist, vocalist, and unquestioned leader. Though both fossil evidence and Neanderthal cave paintings indicate that Hinds had to occasionally fend off challenges to his authority made by bassist Troy Sanders, it is believed that Hinds managed to maintain both his position and order within the band through the use of his gnarly beard and inexhaustible collection of Gibson Silverburst Flying-V’s. Hinds would also use his reflexive near-problem level of alcohol consumption as a natural defense against predators. Troy Sanders was Mastodon’s bassist, vocalist, and “frontman.” Capable of growing a beard to rival that of Brent Hinds, fossil evidence suggests that the two often vied for band supremacy. Though Hinds would inevitably best Sanders, the bassist still boasted one of the gnarliest beards among all Pleistocene Metal bands. Mastodon’s drummer, Brann Dailor ranks among the most capable of the epoch. His filler-heavy, aggressive style proved more than a match for potential predators, while his groove drumming served to both attract mates and communicate with other band members over long distances. The rhythm guitarist and runt of the group, Bill Kelliher possessed neither the technicality to play lead guitar nor the charisma to front the band. As such, he was often relegated to the extreme right end of the stage during shows, and would receive the smallest share whenever Brent Hinds or Troy Sanders came back from a hunt. An artist's representation of the album artwork for Blood Mountain, as discovered by paleontologists in 1936. Mastodon is one of the most well-represented bands in all of paleontology, with remains being found all over the North American and Eurasian landmasses. Because of Mastodon’s extensive fossil record, its evolution and migration can be easily ascertained by scientists. Uncovered in Atlanta, Georgia, the Remission find proves beyond a doubt that Mastodon originated in Sludge Metal territory. The album’s short tracks contain no indication of Mastodon’s later Progressive characteristics, and totally belie the fact that the band was subsisting on little more than abrasive—though awesome—guitar riffs. Leviathan is the earliest Mastodon find to show signs of Progressive characteristics. It is also the first Mastodon album to be referenced in the numerous Billboard Top 200 finds that were discovered scattered across the North American west coast. However, it is clear that Mastodon was still very much in Sludge Metal territory at the time of Leviathan, as evidenced by the album’s continued reliance on abrasive—though awesome—guitar riffs. Far more Progressive than Leviathan, Blood Mountain shows the band definitively leaving Sludge Metal Territory for more musically substantial climates further south. As such, the awesome guitar riffs of previous albums have been supplanted by awesome guitar solos, something hitherto unprecedented in Mastodon's fossil record. By far Mastodon's most progressive work, Crack the Skye features an emphasis on harmonized guitar parts and negative musical space, as well as signs that the band forayed into Classic Rock territory. A review of Crack the Skye found carved in a cave in Guevera, Spain called the record “by far, the best album Mastodon has produced yet.” Due to its unremitting progressivenss, Crack the Skye features 70% more awesome guitar solosper minute of music than any of Mastodon's previous works. ↑ Only the wide-ranged Opeth, whose fossils have been found as far south as Folk and Soft Rock environments, can be considered more adaptable. ↑ System of a Down especially so. ↑ Despite its notoriety, progarchives and its positions have remained contentious. Controversy surrounding it include (but are not limited to) its reductive classification of Progressive music into a number of ill-defined genres that don’t allow for overlap, as well is its purple-colored header, which is just ugly. ↑ The Mars Volta became extinct shortly after the release of Octahedron, which lacked the visceral power of their previous albums. This page was last edited on 16 March 2017, at 01:15.